With so many people focused on their health and outward physical appearances, staying fit is a primary issue for most. Eating right and exercising regularly are some of the things which help them accomplish that. Using the right equipment to work out is also an essential element. It is why recumbent bike purchases and their use has been spiking substantially. There are several of them which are very popular and render exceptional results. However, there are also others which can turn out to be a waste of time and money. In a market that’s over flooded with recumbent bikes, finding and choosing the right one can be a daunting task. Buying guides covering the most crucial factors to consider such as this one can be very helpful. This comprehensive review of those recumbent bikes will aid you in that quest. For the most part, it will point you in the right direction. Criteria such as knowing what to look for, dependability, actual customer opinions, features, and other matters, should be examined. Our recumbent bike review guide goes over all of those variables and more. Why Recumbent Exercise Bikes Are Worth Buying? Gyms and fitness clubs are full of different exercising equipment. One of those is recumbent bikes which are very popular. In part, it’s because of all the great benefits they deliver users. They can help anyone warm up their bodies quickly. The recumbent bikes are also used for full workouts. Perhaps the best reason for purchasing a recumbent bike is due to the benefits. You can have an outdoor exercise tool, without ever stepping out. Indoors, you get to control the entire environment of your workout. People who live in busy cities, will not have to worry about cycling outside. Exercise bikes are also safer and convenient. You can use them anytime, anywhere and don’t have to worry about the weather. Top rated recumbent exercise bikes are also very technologically advanced. Some of them have display consoles which are very high-tech. Not only can you keep track of your progress and performance, but even your heart rate, RPM and distance. Plus owning one will save you time and money on gym memberships. A good deal of the best recumbent bikes is made of high-quality materials and have ergonomic designs. For workouts, they provide one of the best and efficient low-impact cardiovascular exercises available. It’s important to remember that features, dependability, and quality, depending on the price. As with most items, the pricier tend to be the best. However, finding a mixture of value and the elements above can also be done. The five best recumbent exercise bikes in this buying guide fall in that category. They include the top rated and best on the market today as well as the best overall value. The 3-piece high-torque system with which the Exerpeutic 400XL Folding Recumbent Bike is engineered makes it exceptional. It helps to render users with a consistent, smooth and effective pedaling motion. To keep you comfortable, the unit comes with a well-cushioned seat. The seat’s innovative design allows it to be used by different users. There’s an easy to read LCD for keeping track of several important things. Your speed, distance, time spent on the bike, heart rate and calories are conveniently displayed. One of the first things you will appreciate about the Exerpeutic 400XL exercise recumbent bike is the features. One of them is an 8-level magnetic tension control. For customizing your workouts, this is very useful. The larger footplates on the bike are great for preventing your feet from slipping as you work out. People who live in places with limited space will like that it is foldable and quiet. The unit can support a variety of users up to 300 pounds. The backrest and seat are large enough to allow most people to sit comfortably. The double-drive transmission system uses a V-belt which makes it efficient and less noisy than others. Measures calories, distance, heart rate, time, and speed. The flywheel is precision balanced for superior results. The tension control system of 8 levels. Cushioned seat and large backrest are comfortable. Supports users up to 300 pounds. Unit is foldable and quiet. For easy entry, the bike has a great semi-recumbent design. Useful 3-piece high torque crank system. Large LCD which measures numerous activities. People who are over 6 feet tall may not find it comfortable. The front edge of the seat can sometimes be irritable to your thighs. The screen has no backlight. The Exerpeutic 400XL folding recumbent bike has many things going for it. People who used it mention how surprised they were at the great workout they were able to obtain by using it. They also celebrated how quiet, efficient and sturdy the unit was. Based on the quality, pricing, features and customer’s review, this is one recumbent bike worth considering. 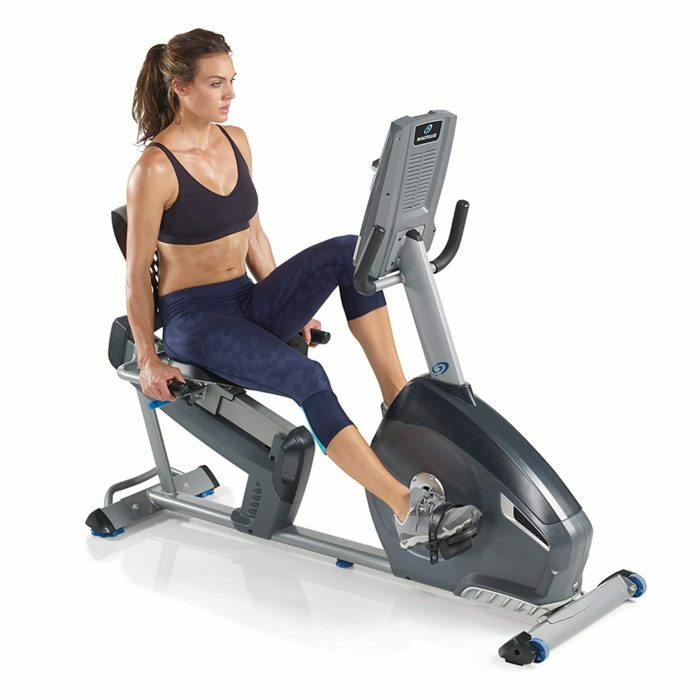 Individuals who are searching for an effortless and fast way to lose pounds will love the Marcy Recumbent Exercise Bike with Resistance ME-709 unit. Anyone is capable of boosting their cardiovascular workouts and endurance with it. All the while, they will not have to give up too much space where they use it. Additionally, time and money can be saved. 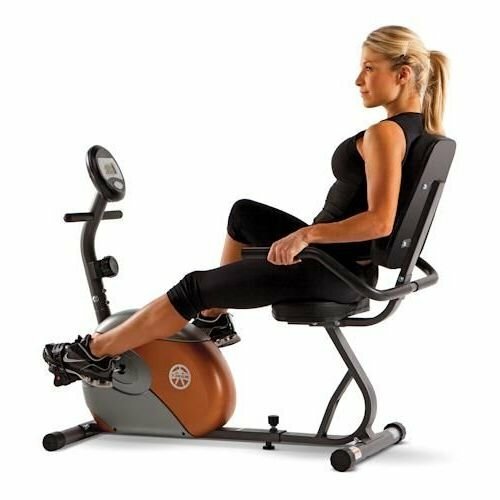 Losing weight and burning calories can be accomplished with the Marcy Recumbent Exercise bike. Furthermore, a person’s cardiovascular body’s endurance can be increased. Those looking to tone, shape, and firm their physical physique will find their answers with the Marcy. The top rated recumbent exercise bike comes full of features. The LCD computer screen LCD readout is fully and ultra-functional. Information on your distance, time, calories burned and speed are available. For comfort, the seat and backrest are padded and large. Plus, the handles are foam-covered and contoured. People like the ergonomically saddle design on the unit. It provides additional support for a person’s back. Seat and backrest are designed ergonomically for maximum support. Easy to read and use LCD computer screen display with large numbers. Keep track of progress such as your speed, amount of calories burned, distance and time. Made of heavy-duty construction and coated with a powder finish. Makes mounting and dismounting a cinch with the step-through design. Eight magnetic resistance levels for maximum workout control. Innovative layout of unit aid considerably with proper form maintenance during workouts. Pedals on the recumbent bike are counterbalanced for superior feet support. Foot straps on pedals are adjustable to fit a variety of sizes. Takes very little space when compared to other units. Lack of tension settings which are higher in endurance. Has no programming capability to use with the LCD monitor. Individuals with big feet may find the straps on the pedals to be inadequate for them. People who have bought the Marcy Recumbent Exercise Bike With Resistance ME-709 model have something to say. According to them, it is by far one of the best all-around exercise bikes on the market. The majority are pleased and surprised by the level of features. Plus, the effectiveness with which the Marcy Recumbent Exercise Bike renders results. For its aesthetically pleasing and ergonomically design, the unit also gets very high marks. 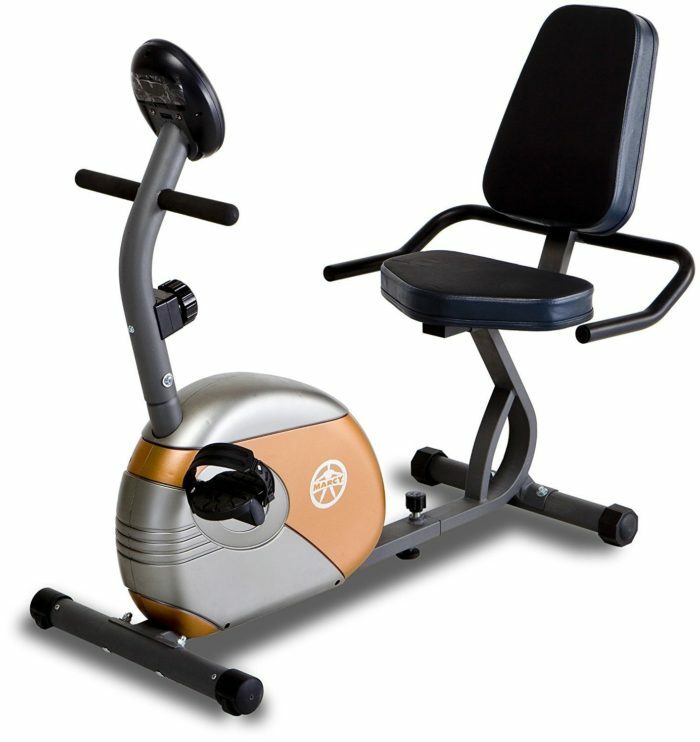 The Marcy Recumbent Exercise Bike with Resistance ME-709 has tons of positive reviews about it. The majority of users seemed all too please to tell others about their great experiences with this equipment. One person by the name of Andee stated “Great Exercise Bike” on his opinion of the Marcy recumbent bike. There were several who wrote “5 Stars” on their testimonial messages. All of them mentioned how useful and effective workout equipment has been. Additionally, a verified purchaser by the name of Historyin summarized it best with his review. He wrote “Love This Bike. Best Workout Ever!” when referring to the Marcy Recumbent. Capable of handling users up to 300 pounds, the Exerpeutic 900XL Extended Capacity Recumbent Bike still manages to be compact. The magnetic resistance provides workouts for anyone that are very challenging. With its many features, it makes for a fantastic piece of exercising equipment. 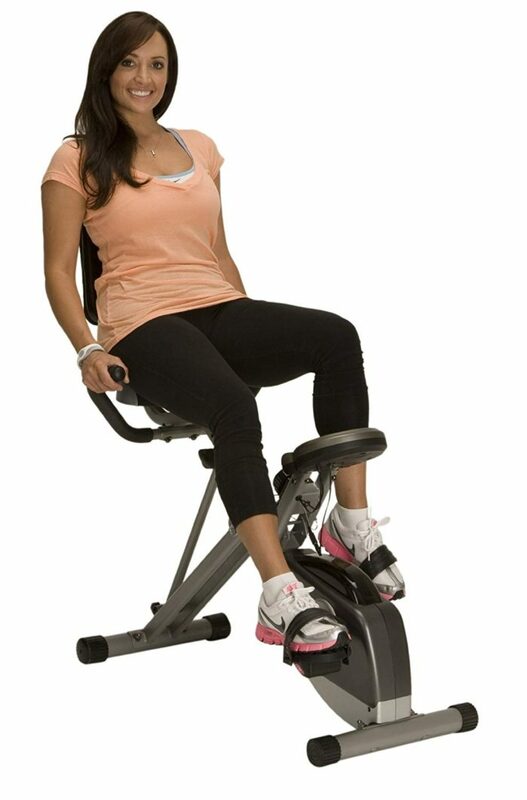 Once a person climbs onto the Exerpeutic 900XL, they will appreciate the wide seat and large backrest. Both combine to deliver a very comfortable seating experience. With eight levels in resistance, users will love the magnetic tension control system on the machine. They allow a person to control their exercising challenge and ride as they progress. The LCD on the unit is both broad and effortless to read. Not only can the calories burned, speed, time and distance be measured, but also the heart rate info. The Exerpeutic 900XL has a PVC waterproof equipment mat included which is foldable. It helps bring the noise reduction levels down as well as protects the floors. Users will be pleased with its ergonomically and aesthetically pleasing innovative design. Magnetic tension system up to 8 levels. The large display on LCD computer screen. Pulse sensors for the hands. Back seat and backrest are large for extra comfort and support. Renders excellent cardiovascular workouts with minimal noise. It’s equipped with a smooth torque cranking system. The unit’s large display makes reading your progress very easy. Very well-assembled recumbent bike and sturdy. Some find the instructions are not that easy to follow. Tension can be hard to get used to for new users. Seat not as comfortable as those in gyms. 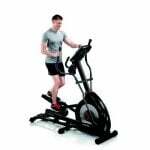 Once you take the price, features and other factors into consideration, the Exerpeutic 900XL is easy to recommend. It delivers a great cardiovascular workout for a reasonable price. We also found countless positive testimonials about the piece. Some users voiced some concerns about the bike. They only gave it four stars or less. But, the majority were confident and went on to recommend it. Overall, anyone who is on a budget and looking for a great bike should consider the Exerpeutic 900XL. 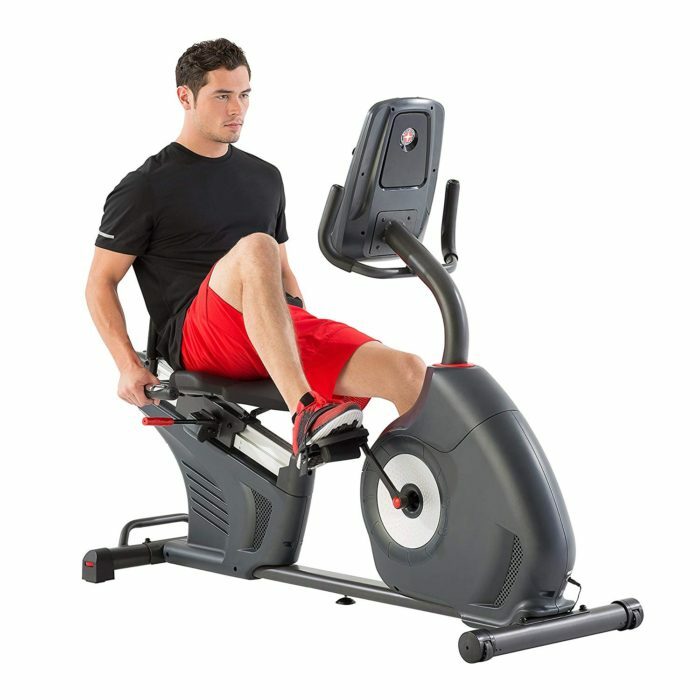 Individuals looking to take their cycling experience to another level should think about the Schwinn 270 Recumbent Bike. Packed with features that leave others in the dust, the recumbent bike provides results which are exceptional. The 25 levels of resistance are more than enough; especially for anyone who is serious about their workout regimen and choices. Each provides workout intensity options which are broad in range. The Schwinn is one of the most expensive recumbent bikes on this buying guide thus far though. But, most of that has to do with all of the extra features this bike has compared to those other models. Until you set your eyes on this recumbent bike, you will not notice how many other characteristics it has. They are some of the things which set it apart from the rest. For instance, the Schwinn comes with Bluetooth capability. That lets it sync with other tracking fitness apps, as well as the Schwinn Trainer. The DualTrack LCD has built-in speakers. That makes it a media shelf with an MP4 input port. Plus, there are an adjustable fan and USB media charging port. The unit also comes with 29 programs for extended workout capability. That includes nine heart rate control, 12 user profiles, four custom and much more. If that wasn’t enough, you also have the flywheel mechanism to consider. The high-speed inertia drive system is too high drive. They render workouts which are smooth and effortless. Plus, they are also far more consistent. When it comes to seating, the contoured seat is also worth praising. The lumbar support backrest is ventilated for more comfortable and cooler workouts. Bluetooth connectivity for synching with other fitness tracking apps capability. The beautiful and durable design is sturdy. LCD blows the competition away with its many extra features. Grip heart rate is ergonomically placed. The 25 levels of resistance provide intensity options for workouts, unlike most recumbent bikes with far fewer tension options. The seat rail system has an aluminum slider for easy seat adjustment. Seating is contoured and ventilated for cooler workouts. Very quiet and efficient during exercise regimens. Cost a few hundred dollars more than other recumbent bikes. The seat is made out of plastic which can be uncomfortable for some after 30 minutes of using it. The speakers on the unit are not that loud. Cord for the A/C plug sticks out. Although this is one of the most expensive recumbent bikes in this top 5 review, it is still worth pondering. The fact that the unit has so many different and extra features is one. Secondly, the 25 levels of resistance blow the competition away. Bluetooth connectivity capability and 29 programs are also other reasons. Any person who wants all these extras and can afford it can get them from the Schwinn 270 Recumbent Bike. Those who have already purchased the Schwinn 270 Recumbent bike, attest to how much they love it. Most of the customer reviews we found painted a positive picture. Customers appeared to have a great experience such as a person named PajamaGuy. He wrote that “It is great for seniors. I highly recommend it to my friends” in his review. There was also a woman by the name of Twin Tiers Gal who stated “Nice exercise bike for the money.” Lastly, there was a man by the name of Nick. He said “Bike while playing video games and watching Netflix!” which is helpful for those who need another reason to buy it. Packed with tons of beneficial workout features, the Nautilus R614 Recumbent Bike easily makes it to the list as a top rated workout unit. The design and color are gorgeous and sturdy. There’s an LCD console with a DualTrack multi-display capability. When it comes to quality and performance, you also get your money’s worth. That includes up to 20 levels of resistance and high inertia and speed drive system. The technologically advanced capability on this bike blows leaves other bikes in the dust – no pun intended. That includes 22 programs functionality. These will give the user access to 9 profiles, up to 8 heart rate control, two fitness test, two custom, and one quick start. The Goal Track function allows riders are exercising to set their own individual goals. When working out on a bike, users typically spend some time sitting on it. It is why the usability and comfort of the seat are crucial. The position and backrest on the unit are both ventilated. More relaxed and more comfortable rides are the result. To adjust the seat, the rail system slides and locks solidly. Consistent and smooth workouts with the weighted flywheel. Two LCD windows display workout detail statuses of up to 13 different items. A USB port for charging and exporting data to myfitnesspal.com or Nautilusconnet.com. Speakers are acoustically chambered for louder sound. Twenty levels of resistance for greater choices in workouts. Very easy to assemble and takes less than two hours for most. Has a built-in fan which most people think is a must for recumbent bikes. Efficient workouts that are also very quiet. Media rack and speakers on the unit come in handy during workout regimens. Capable of handling users of up to 300 pounds. The seat can be uncomfortable for some people who are more substantial. Insufficient info provided on how to use programs for the bike. Directions are not that easy to follow. Lacks heart rate telemetry enabled capability. Out of the top 5 best recumbent bikes in this buying guide, the Nautilus R614 Recumbent Bike is second when it comes to price. It costs about two hundred dollars more than the other ones. That is because of the extra features and workout capabilities it has. The 22 programs, dual LCD, and 20 resistance levels. In addition to all of those, there’s the quality of the bike and workout results. Based on the positive customer reviews, functions and other criteria, this unit delivers. Purchasing a great recumbent bike can be confusing since there are so many to choose from. However, finding those which are top rated helps narrow down the choices. Once you take into consideration things such as features and capabilities, the list gets narrower. These top 5 best recumbent bikes all meet that criteria and then some. Anyone of them will be more than capable of aiding you in your quest to tone your body and get fit. Losing weight and staying in shape have been made a lot more comfortable with recumbent bikes. All you need to do is find the right one for you from this list to get started on that quest. Please share and tag your friends who you think they’ll like this post. I greatly appreciate your kindness! What Are The Benefits Of An Inversion Table? The PowerBlock Elite Dumbbells Will BUILD Loads Of Muscle, So Who Cares If They’re UGLY?